Return the quark masses to be used; if not empty these masses should be considered instead of the ones set in the particle data objects. Return the used for different numbers of active flavours. Return the number of avtive quark flavours. Return the used for nflav active flavours. Return the used for corresponding given scale. 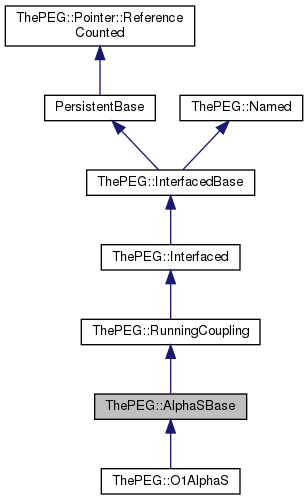 Return the value of the coupling at a given scale using the StandardModelBase object used by the EventGenerator. Return the scale factor, which may be used to globally rescale the argument of the running coupling. Return the value of the coupling at a given scale using the given standard model object, sm. The quark masses to be used; if not empty these masses should be considered instead of the ones set in the particle data objects. Flavour thresholds, set from the virtual functions in the initialization. The values of corresponding to theFlavourThresholds, set from the virtual functions in the initialization. Describe an abstract class with persistent data. AlphaSBase is an abstract base class used by the StandardModelBase to implement the QCD coupling, . The AlphaSBase also encodes the number of active flavours at a given scale and the for a given number of active flavours or for a given scale. The interfaces defined for AlphaSBase. Definition at line 28 of file AlphaSBase.h. Return the flavour thresholds used. The returned vector contains (in position i) the scales when the active number of flavours changes from i to i+1.